Tonight and tomorrow, 9 Nisan, is the Yahrzeit of Rabbi Aryeh Levin (1885-1969), affectionately known as Reb Aryeh, was a Rabbi who was known as "The Tzaddik of Jerusalem" for his kindness and attention to the poor, sick and downtrodden elements of society, and as "The Father of Prisoners" for his work with members of the Jewish Underground movements who were imprisoned by the British during the British Mandate period and with convicted criminals. Notwithstanding his activism, he behaved with extreme modesty and humility, exuding a quiet, personal warmth that touched many Jews, both religious and secular. 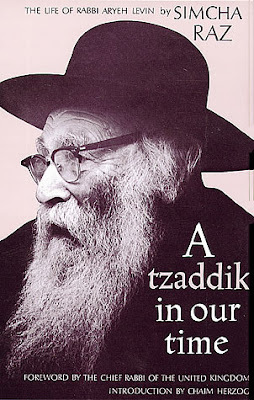 Rabbi Levin was the subject of the book [pictured above], A Tzaddik in Our Time: The Life of Rabbi Aryeh Levin, by Simcha Raz. Reb Aryeh is not known for Negina, but his life was certainly a Great Song to the One Above. Last year’s post, Tzaddik of Yerushalayim - in Our Time, can be found here. The following has been adapted and excerpted from an article by Dovid Rosoff, author of Land of Our Heritage, Safed: The Mystical City, The Tefillin Handbook, and When Heaven Touches Earth. It appears on the Jewish Mag website. 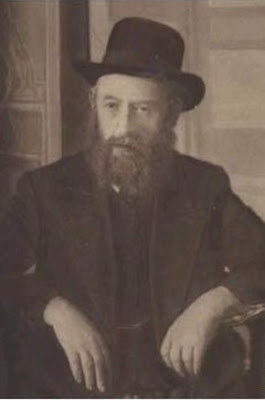 AS EARLY as 1927, Rav Aryeh Levin began visiting Jewish prisoners who had been found guilty of political crimes like possessing a weapon or smuggling contraband into the country. The British overseers of Palestine stiffened their grip on the necks of the Jews in direct proportion to the Arabs’ penchant for stirring up violent riots. In response, the Jewish underground, comprising groups like the Hagana, the Palmach, and the Irgun increased their activities, which led to many of their members being jailed. In 1931 the British authorities requested that the Chief Rabbi appoint a prison chaplain who would visit the captives on Shabbos. Rav Kook turned to Rav Aryeh Levin, who worked as the supervisor in the Eitz Chaim Talmud Torah, and asked him to take the position. Rav Aryeh accepted, on the condition that he would not receive any compensation for his time. Every Shabbos morning Rav Aryeh walked from his house in Mishkenos to the Russian Compound, where the main Jerusalem prison was located. He prayed together with the prisoners, sat and talked with each one, acted as an emissary between them and their families, and generally filled the vacuum in their lives. He never tried to force his religious values on them; at most he gave them a Book of Psalms to read. The inmates were captivated by his genuine warmth and sincerity, and the honor and respect with which he treated them. Very often, we read or hear stories of how a great Rabbi or Chassidic Rebbe foresaw what would happen to one of his followers, or how he saved him from a great distance in space or time. But it is rare indeed to read about the opposite – how the followers actually helped their mentor. But Rav Aryeh Levin merited such aid, as the following indicates. SHABBOS IN Jerusalem’s central prison was as one would have expected. There was happy anticipation in the air as the prisoners waited for the arrival of Rav Aryeh Levin, who would bring some light and hope into their otherwise drab existence. Rav Levin arrived on time for his regular weekly visit. As usual, he had the prisoners join in Shacharis (the morning prayer service); and as usual, when the time came, he began reading the weekly portion from the Sefer Torah (scroll). 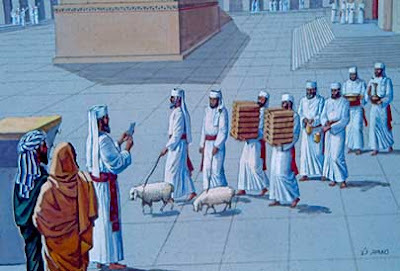 As he was in the middle of the Torah reading, one of the Arab guards approached and asked him to come outside, as there were people waiting for him. Rav Aryeh, however, had no wish to interrupt the reading and motioned to the guard to be so kind as to wait until he was finished. A few minutes passed by and once again the guard appeared with the same request. Once more, though, the rabbi motioned to him to wait until he finished reading from the Sefer Torah. Soon, however, the captain of the guard himself came, and asked Rav Levin to accompany him. There could be no further doubt: something quite serious must be afoot. Rav Aryeh asked one of the inmates to continue the reading, and he left the cell with the captain of the guard. 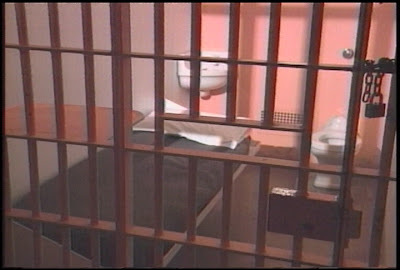 Once outside, he saw his son-in-law waiting for him at the prison entrance. In his heart he knew at once that some accident had occurred. However, he did not utter a word, and with the wisdom of silence between them they set off by foot to the Sha'arei Chessed neighborhood, where his married daughter lived. That night, when Shabbos was over, the Arab guard from the prison knocked at his door. Burning with curiosity, the inmates at the jail had bribed him to go to Rav Levin’s home and find out the reason for his sudden departure. Rav Aryeh explained what had happened and told them not to worry. The next Shabbos the prisoners flocked around him and asked how his daughter was. “As well as can be expected,” he said emotionally. During the Torah reading, an unusual thing occurred during the Mi Sheberach (“may he be blessed”) prayer recited after each of the seven aliyos, in which one asks the L-rd to bless and protect the man just called to the Torah. It is customary that the man called to the Torah pledges a sum to charity. As Rav Aryeh duly recited the Mi Sheberach for the first prisoner called to the Torah, he was taken by surprise to hear the man announce that he was pledging a day of his life for the recovery of the good rabbi’s daughter. When the time came for the Mi Sheberach of the second called, he announced that he forfeited a week of his life for the sake of the sick woman. The third man called pledged a month of his lifespan; and so it went. At last it was the turn of the seventh man, Dov Tamari, who later became a professor at the Technion in Haifa. Rav Aryeh looked at the young man and burst into tears. He was moved beyond words to see how devoted these men were to him and how much affection they bore him. Unable to continue with the prayer service, he shook hands warmly with every single one of the inmates and went straight home. That evening, after Shabbos, members of his family came to tell him that his daughter was beginning to show signs of recovery: she had started to move some limbs. A few days went by, and her health returned completely, in utter contradiction to the medical prognosis, which predicted a long period of illness and convalescence. In 1965 (5725), four years before his passing, Rav Levin was honored at a ceremony assembled by the veteran underground resistance fighters from the Mandate period. Timed to take place on his eightieth birthday, it was held in the courtyard of the old central prison in the Russian Compound. Then he added, “I do not know if I shall be privileged to be with you again like this. All I ask of you is this: Tell your children: There was an old Jew in Jerusalem who loved us so very much!” With that he burst into tears, and among the thousands of people there, not a dry eye was to be found. Zechuso yagein Aleinu – May Reb Aryeh’s merits protect us! A friend of mine at Yeshiva University and close to us Betarim was Benji Levine, grandson of Rav Aryeh (he is well known for his famous Four Jews skit). When I told him that I was taking my junior year off to go to Israel for a year in the framework of the Zionist youth movement leadership program (Machon), he asked me to please convey personal regards to his grandfather. So, when I arrived in Jerusalem in late August 1966, I sought out Emmanuel Hanegbi, Lechi veteran, estranged husband of Geula Cohen and father to Tzachi. I told him that I need to see Reb Aryeh as soon as possible. Coming from NY, I really wasn't aware of how compact Yerushalayim is (well, was) and as we were in the old Herut branch offices behind the Mashbir, he said no problem and he locked up and we walked out and around and into the neighborhood behind Machaneh Yehuda and right into his house which was all of two rooms (it still is a Yeshiva today). He welcomed us in and when I told him the purpose of my visit, his eyes lit up and then he took my hand into both of his and sort of rubbed my hand. Immediately, my hand and then body grew warm. I had heard of this special ability of his and thought it metaphorical but I give testimony now that the warmth was real and physical and it is something I will never forget. He died in Nisan of 1969 and many saw that of one of his last acts of running away from kavod [honor] as he had specifically asked that there should be no hespedim [eulogies] at his funeral. Many felt that as he didn't trust anyone to really fulfill his last request, he somehow arranged it that his be niftar [pass away] in Nisan when no hespedim are said in any case. WHY DID THE OHEV YISRAEL LEAVE APTA? This Shabbos, the 5th of Nisan, is the yahrzeit of Rebbe Avraham Yehoshua Heshel of Apta, also known by the name of his sefer, the Ohev Yisrael. Be sure to check out last year’s post, The Joy of the Ohev Yisrael, for a lot more about him and his Negina. The following has been excerpted and adapted from this week’s English HaModia magazine. It was written by Shia Ellen. 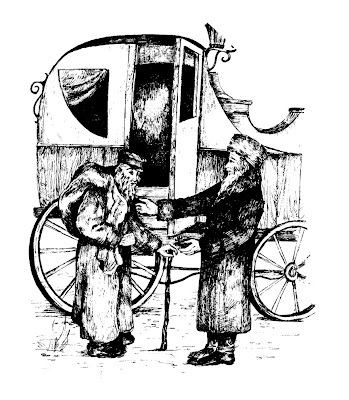 The Apta Rav was the only one of the four spiritual heirs to the Rebbe Reb Elimelech who served as a Rav as well as a Rebbe, and in 5560 , he accepted the position of Rav in the city of Apta, one of the oldest and most important Jewish communities in Poland. In honor of their new Rav, the venerable shul in the city changed its nusach from Ashkenaz to Sfard. It was in Apta that thousands of began to flock to him for brachos [blessings], and he soon became famous as a miracle worker, in addition to being a posek [Halachic decisor]. For nine years, he served as Rav in Apta, and then to the astonishment and consternation of its townspeople, he accepted the position of Rav in the distant town of Yassy, Romania. The people of Apta had formed a remarkable bond with their Rav, and he too had a special affection for them. He promised the residents that he would always be referred to as the ''Apta Rav'' and for the rest of his life, when he signed his name, he added, "of Apta." To this day, the Jews of Apta have the eternal merit that the name of this great tzaddik is forever linked with their town. This question has puzzled many historians over the years, prompting various, often unlikely, theories. Many biographers seem unaware of the following two explanations. According to Rebbe Yissachar Dov of Belz, the Apta Rav heard a voice from Shamayim [Heaven] proclaiming that HaRav Meir ben Shmuel was to become the Rav of Apta. Rebbe Avraham Yehoshua Heshel realized that since the town could only have one Rav, it meant that either he would move to another town, or pass away from this world. It was then that he decided to move to Yassy. Shortly thereafter, HaRav Meir, the author of sefer Ohr LaShamayim, became the Rav in Apta. [the HaModia author notes that he heard this from the present Belzer Rebbe Shlita]. "My father, Reb Shmuel, was a poor melamed [teacher-tutor] in a small town. His older brother, a very wealthy man, lived in Apta. Due to various calamities, my father and his brother had been separated from each other when they were eight and ten years old, and had no knowledge of each other's whereabouts. My uncle died childless, and left his young widow with very little information about his brother. Being childless, she was required to get chalitza from this unknown brother - but how was she to find him? "The Rav of Apta at that time suggested that she send the letters to all the Rabbanim in all the neighboring countries, telling them that there was a widow in Apta searching for so-and-so to give her chalitza. She should also announce that when the brother comes and fulfills his obligation, she would give him half of what she inherited from her husband. 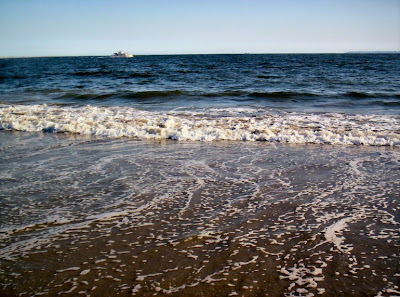 "My father took his bag and walking stick and set out for Apta. He came to the Rav of Apta, and it turned out that he was the person they had sought. When the chalitza was completed, the woman insisted that my father take half of his brother's inheritance, but my father insisted on keeping the promise he had made to my mother and steadfastly refused to take any money. "The widow insisted that she had no wish to keep this money, and if he would not accept it, it should remain in the community’s possession. "My father’s actions caused a great tumult in Heaven. It was decided to reward him; and so, although my parents were very old, they were blessed with a son. I am that son," concluded the Ohev Yisrael. "Now you know why I consented to come here and be the Rav, but only for a large salary. I was only taking back the money that had been due my father, but was left in the hands of the community. Now that I have received the full amount, I can leave here and go to Yassy." For four years, the Apta Rav served as Rav and Rebbe in Yassy. While many in the community recognized the great privilege of having the tzaddik in their midst, others did not; and while today the very notion seems incredible, the Apta Rav was viciously persecuted by segments of the Jewish community. It is said that when family members saw how much the Rebbe was suffering from the actions of these individuals, they asked him what he did not curse the offenders. On 18 Kislev 5572 , the Rebbe Reb Baruch, Rebbe of Medzibuzh, was niftar [passed away]. 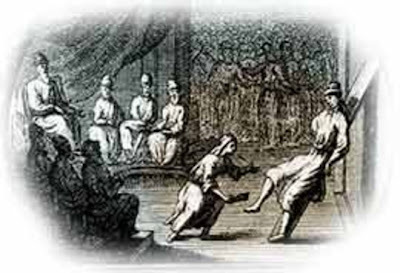 The Jews of Medzibuzh had become accustomed to having a venerable tzaddik in their midst. Only half a century earlier, the Baal Shem Tov had resided there. 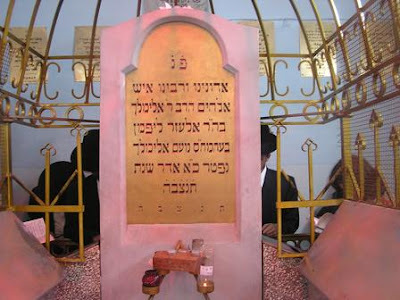 For the past twelve years, it had been his grandson, the Rebbe Reb Baruch, and for the twelve years before that the Rebbe Reb Baruch’s older brother, Rebbe Moshe Chaim Efraim of Sudylkov, the author of the Degel Machaneh Efraim, had served as their Rebbe. 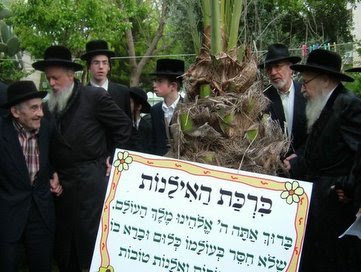 The community decided to invite the Apta Rav to relocate to Medzibuzh, and in 5573, he left Romania and became Rebbe in the city of the Baal Shem Tov. Two years later his close friends, the Chozeh of Lublin, the Kozhnitzer Maggid, and Rebbe Menachem Mendel of Riminov, were all niftar within months of each other. 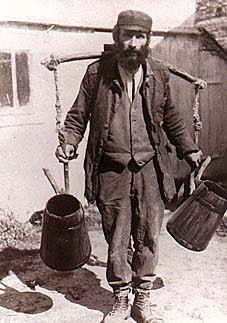 The last surviving member of this unique group, the Apta Rav, was now considered the oldest Chassidic Rebbe of the time. All major decisions were sent to him for arbitration, and his word was feared throughout Eastern Europe and even as far away as Eretz Yisrael. Like the two previous tzaddikim who lived in Medzibuzh, the Rebbe Reb Baruch and the Degel Machaneh Ephraim, the Apta Rav lived there for twelve years. Shortly before his petira [passing], he bade farewell to the table at which he had studied, the bookcase full of sefarim, and to the mezuza on the doorpost. He returned to his bed and began to say, "Ha’aderes vha’emuna, l’Chai Olamim – Strength and faithfulness are His, Who lives Eternally," and it was with these words that he departed this world, on the fifth day of Nisan 5585 . Today, Rosh Chodesh Nisan, is the first opportunity for Birchas Ilanos, the blessing recited over the flowering of fruit trees. Be sure to check out the links in the first post to learn more about this special blessing! As last year, I hope to be joining the Bostoner Rebbe Shlita here in Yerushalayim later today for this special mitzva! Hyde Park’s Chadrei Chareidim reports that thousands of Jews had arrived by yesterday [the yahrzeit] for Tefillos [prayers] at the Rebbe Reb Elimelech’s kever [gravesite] in Lizhensk. Among them were the Rebbes of Nadvorna, Rachmistrivka, Koidinov, and Atniya; Rav Rafael Abuchatzera, Rav Yekutiel Abuchatzera, Rav Yisrael Hagar, Rav Menachem Mendel Hagar, Rav Menachem Ernster, Rav Y.D. Grossman, and scores of other Rabbanim and public figures.